Before I even start with all of the unboxing pictures and raving about the fantastic items that were contained inside the July Fairy Loot box, I want to start by saying that this month’s box was one of the better subscription boxes I have ever received. EVER. While I always feel a bit hesitant ordering international boxes because of the shipping costs, the curation of the July Pirates and Power box topples any doubts I may have had. When I posted my review of the May Fairy Loot box, I tried to break down the contents by price, just so I could see that the cost of the box including shipping was worth me continuing to purchase this subscription. As I said earlier, I believe that this box was so well put together that I wouldn’t mind whether or not the value of the box was above and beyond what I paid for it. However, for the benefit of anyone on the fence about internationally ordering a Fairy Loot box, I will continue the tradition of assigning a monetary value to each item included in the box. And with all of that being said, I present the July Fairy Loot: Pirates and Power! I am new to the genre of ‘middle grade reads’, but I am always looking to expand my reading horizons, and that means reading books that may be below my reading level, as well as above. The Wild Robot is a book that I stumbled across on one of my many Amazon escapades. Much like my experience with the only other younger book I have read, Pax, I saw the cover of The Wild Robot, I glimpsed a few of the illustrations waiting for me inside, and I knew I needed this book in my life. 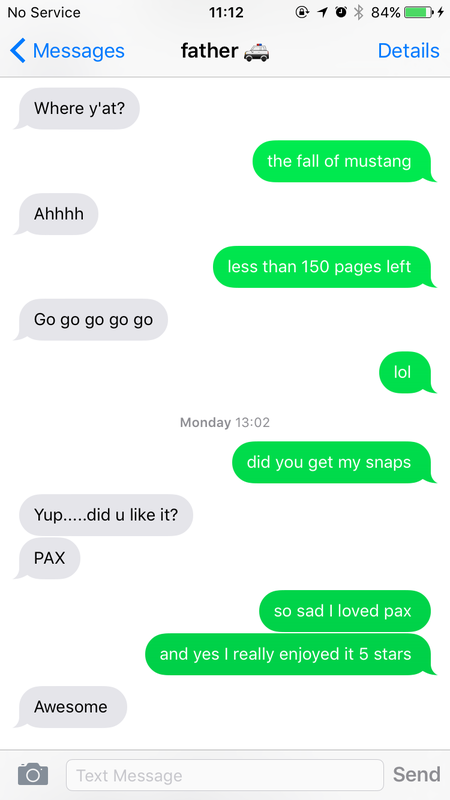 You can check out my review for Pax here. Hi, everyone and happy Monday! I participated in a read-a-thon this weekend called 24in48, created by Rachel at 24in48. I have always wanted to participate in a read-a-thon, but have never really taken the plunge because they are usually oriented around a 24 hour reading marathon. As an adult with a full time job, I just can’t do the all-nighters anymore, they will ruin my sleeping schedule for a week, rather than a day back when I was in college. Anyways, the attraction of the 24in48 marathon is that out of the 48 hours in the weekend, you aim to read for 24 of them. Much easier than a 24 hour sprint! I cataloged my reading adventures through Twitter, and briefly on my bookstagram, but I wanted to take this time to show you how my weekend played out. Enjoy! So, some of my bookstagram followers may already know this story, but for the sake of this post I am going to tell it again. My wonderful father listens to a lot of audio books. Out of the 60 books that I read a year, he listens to 60. It is absolutely insane how he finds the time to listen to so many books, but I love it. It has taught me that readers come in all forms: there are no specifications or qualifications to be an avid reader, only the love of books in general. Recently, he listened to the entire Red Rising Trilogy by Pierce Brown, and told me that it was one of his favorite series ever. I thought that this statement spoke volumes: I mean, damn, on his audible account alone there has got to be at least 30 different series. He was actually so excited about it and wanted to share the experience with me, that he bought me the hardback of Red Rising, shipped it to me via Amazon Prime so I received it in two days, then promptly began to accost me with text messages and snap chats wondering if I had started and where I was in the story. It has been a little while since I have put together a list for some Top 5 Tuesday action! I carry around this notebook in my purse all the time, that I use to brainstorm all of my blog and bookstagram ideas in, and I have about four unfinished top five lists. I don’t know why it is so hard to come up with only five items, but clearly I have decision making issues. So I apologize that it took me several weeks to just buckle down and finish one of these! But without further ranting, I present to you my personal Top 5 OVER RATED books! I am nervous. I am going to catch some slack for this. Deep breaths, I can do this! Yes! Yes, I can! Ok, here we go… again. I read the first book in the Mistborn trilogy back in January of this year. I loved the book, and immediately ordered the second one in the series, but didn’t pick it up until this month. Why is that do you ask? Well, these books are kind of large and intimidating. It took me a week and a half to read the first one, where I could almost read three normal size books in that time frame instead. But, I told myself that summer is the time for fantasy, and it was high time I knock this one off of my TBR list, so I finally picked up The Well of Ascension the last week in June, hell-bent on finishing it to include in my June wrap-up. The Well of Ascension picks up about a year after the conclusion of the first book.